Specialists at Great Ormond Street say eight-month-old Charlie Gard is unable to move and has significant irreversible brain damage. In April doctors were told they could move Charlie into palliative care. His parents said they were "devastated by the result" and will apply to the Appeal Court to re-examine the decision on Tuesday. Chris Gard and Connie Yates, of Bedfont, west London, have raised £1.3m to take their son to the United States for pioneering treatment. Charlie, who was born on 4 August 2016, has a disorder called mitochondrial depletion syndrome, which affects the genetic building blocks that give energy to cells. It causes progressive muscle weakness and brain damage. He is thought to only be the 16th person in the world diagnosed with the condition. 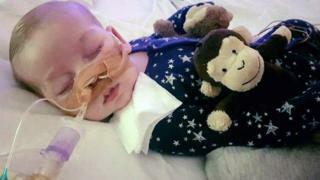 Doctors had argued that continuing life-support treatment would not benefit Charlie but "prolong the process of dying". A lawyer representing Great Ormond Street Hospital said: "This is not pioneering or life-sustaining treatment, but a purely experimental process with no real prospect of improving Charlie's condition or quality of life." Miss Yates, 31, said: "We were devastated by the result of the last hearing. "Charlie is still strong and stable. He is growing more beautiful by the day and we knew we couldn't just give up on him." The couple have dispensed with the services of their former solicitors, Bindmans, and have hired a new legal team.